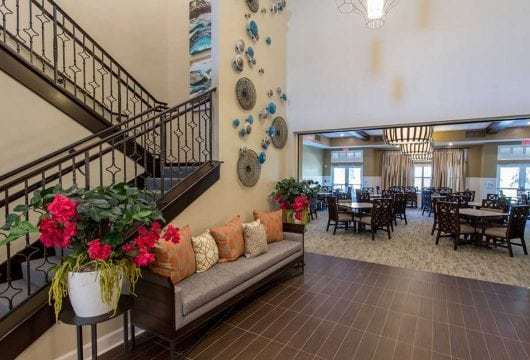 Welcome to the Crossings at Riverview, a premier senior living community near Tampa, Florida. At our vibrant, nurturing, and supportive community, we offer assisted living and memory care services. Our talented team supports residents and their families, encourages active lifestyles, and aims to create a home-like atmosphere. We are located on the Alafia River on twelve beautifully landscaped acres, which include four-hundred feet of riverfront and magnificent views. With helping hands and ready smiles, our team will help you feel right at home at the Crossings at Riverview. Residents enjoy their own spacious suites and receive assistance from our well-trained care managers, who truly understand seniors and their needs. Our talented team members provide positive assistance and encouragement to support residents with Alzheimer's and dementia. We give seniors and their caregivers peace of mind and temporary assistance, offering both short-term and long-term respite stays. Our parents moved to the Crossings approximately two months ago. We have experienced strong support from the staff and management team, helping get them settled and comfortable. I first contacted Jennifer in November and immediately put down a deposit, sight unseen. The philosophy of care was what I wanted for my mother. At the Crossings at Riverview, we enrich each resident's quality of life by supporting healthy habits that keep seniors' minds and bodies active.